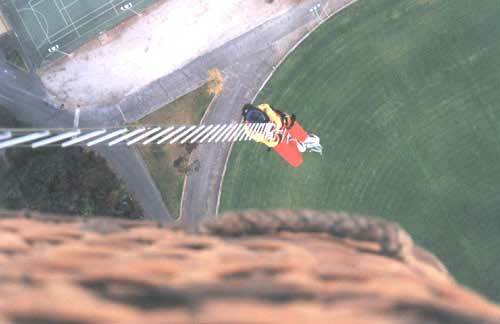 In March 2003 the TV show ‘China’s Greatest Dares’ (based on Who Dares Wins) was in South Australia filming the show. There were several stunts in different locations with different contestants. 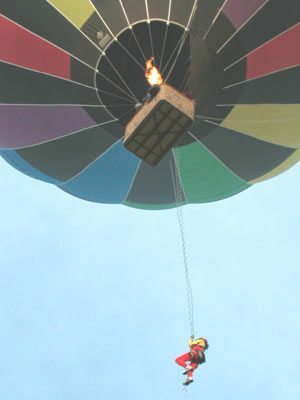 Our contestant had to climb up a narrow wire ladder, in midair several hundred feet up, and climb into the balloon basket. The contestant had no idea what the task to be completed was until she arrived at the Nuriootpa school oval, where we had the balloon fully inflated, ready to go. So with great courage she accepted the dare and with the outstanding professional help of Southern Stunt Academy Pty Ltd, she was suited up with a standard rock climbing harness, gloves, helmet (with camera mount of course) and a safety line attached to the balloon basket at one end and the rock climbing harness at the other. As soon as she was ready, we lifted the balloon off the ground but still tethered to the ground on a long rope. Then we rolled out the ladder so the end of it was at ground level. She then stepped onto the bottom rung of the ladder and with a blast of heat from the balloon burner we released the tether rope and we were off! 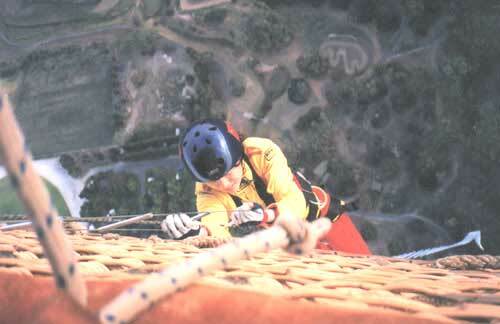 Once we were several hundred feet above the township, she started the long climb to the basket. Step by step she made it to the basket, climbed in and we all enjoyed the rest of the flight over to Angaston.